In a typical meeting, people walk in and are handed a typed sheet of paper that shows them the meeting agenda. It usually includes the date, the meeting topics, and the time allotted for each topic. Sometimes it acknowledges who is presenting or leading the topic. Most participants give this piece of paper about two seconds of their time. The standard approach for making agendas is perfectly fine for quick meetings among people who work together regularly. But for meetings that matter, for meetings that take a good amount of people’s time and attention, and for meetings that bring together people from across disciplines or departments, visual agendas work much better. 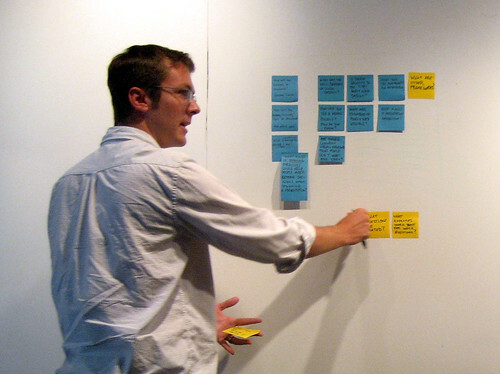 When you create a visual agenda, people look it over and linger on it longer. They actually read the desired outcomes and review the steps they’ll take to get there. 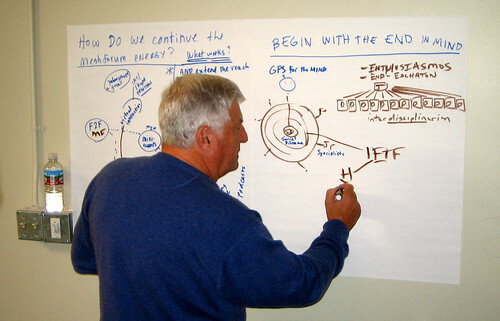 The energy level rises when participants walk into a room and see a large, colorful, hand-drawn display. People start to talk about it with each other. 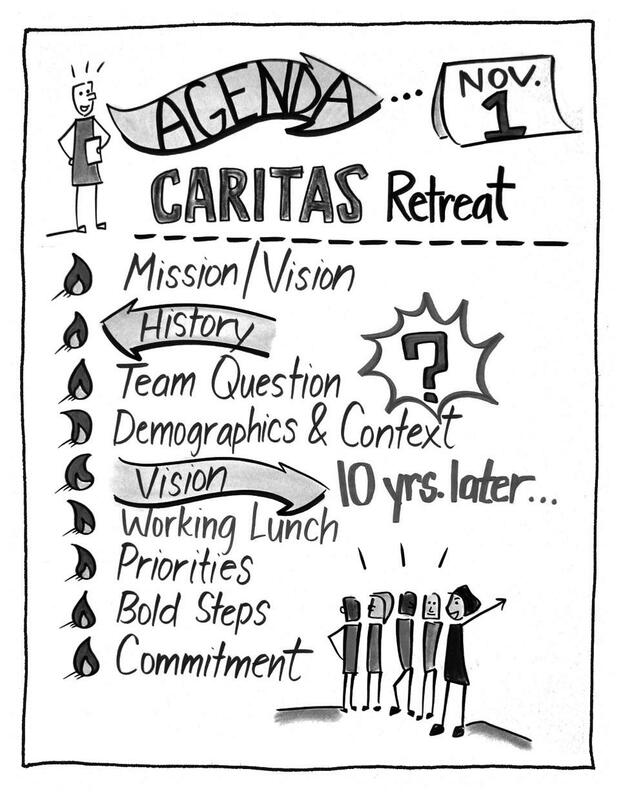 A visual agenda implies that the day might be interesting; it sends a signal to the group that the meeting matters. Visuals also help participants recall later what the meeting was about. 1. Establish a desired outcome(s) for the meeting and craft an agenda that will get the group there. 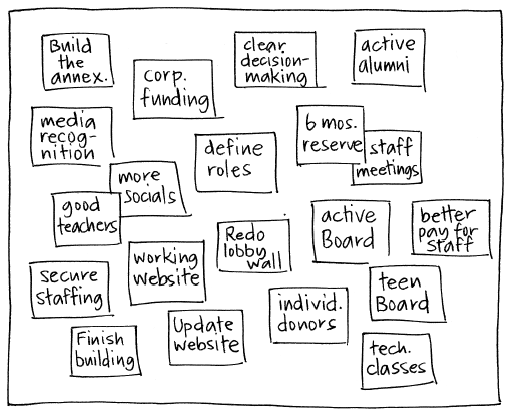 Choose a visual framework that represents the tone or theme of the meeting. 2. Draw the agenda in a nontraditional and creative way on a large sheet of paper or display it using presentation software. 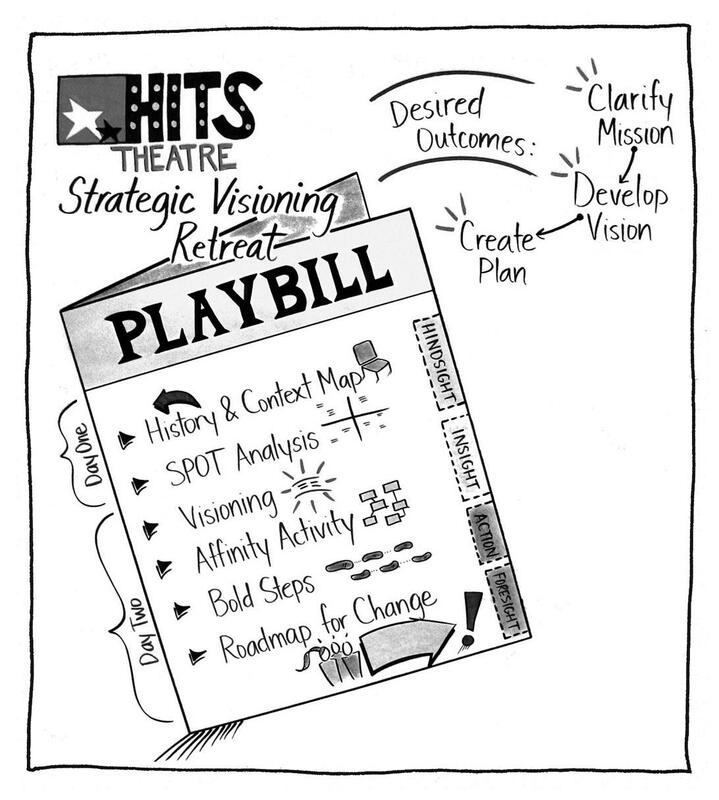 A visual agenda is a gesture to the group that you spent time before you took up theirs. So, take the time to build a good road map to your outcomes. 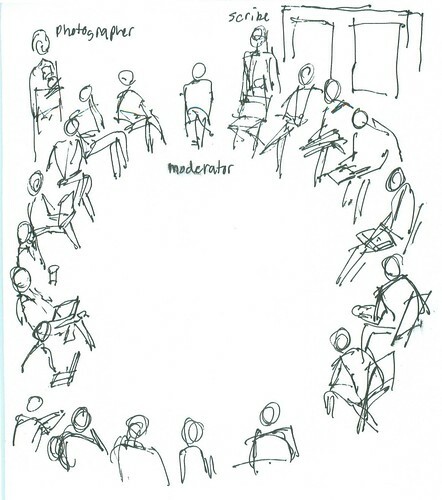 And when drawing or creating the visual agenda, think of metaphors that represent a theme of the meeting. 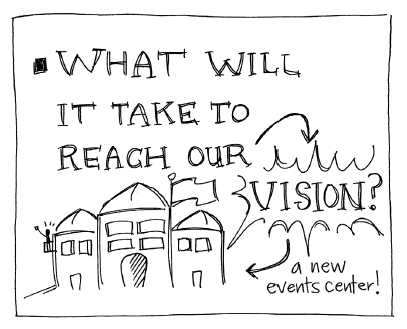 Draw pictures that symbolize the company’s mission or work. If you’re working at a vacation rental company, draw a beach scene with each footstep as a stage of the agenda. Draw a forest scene if you’re working at an environmental organization; a circuit board if you’re with a tech firm. Brand the agenda in creative ways. If you’ve got copywriting chops, think of interesting phrases to describe each stage of the meeting. And if you have neither copywriter nor artistic instincts, ask someone who plans to attend the meeting to help you. 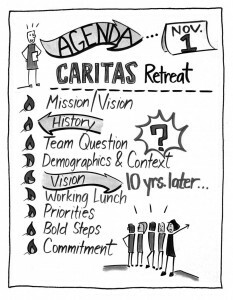 Creating a visual agenda is a small investment in a meeting, but it offers a good ROI. 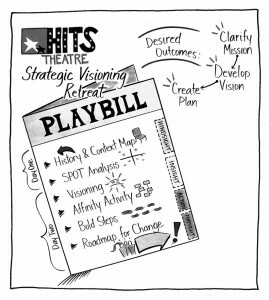 The Visual Agenda game was inspired by The Grove’s practice of creating visual agendas before meetings. 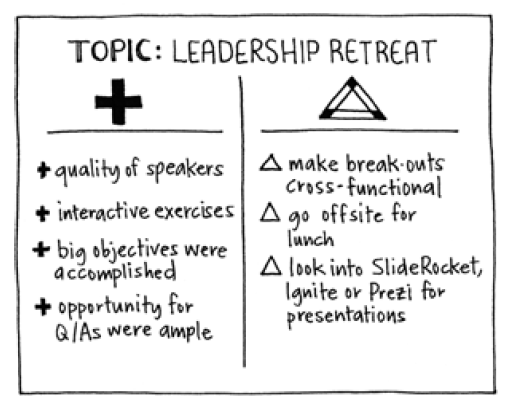 Open Space technology is a method for hosting large events, such as retreats and conferences, without a prepared agenda. Instead, participants are brought together under a guiding purpose and create the agenda for themselves in a bulletin-board fashion. These items become potential breakout sessions, and participants have the freedom to “vote with their feet” by moving between breakouts. Open Space was founded by Harrison Owen in the 1980s out of a desire to “open the space” for people to self-organize around a purpose. Many meetings and examples have been recorded at Openspaceworld.org. Hosting a small Open Space meeting is fairly straightforward, but requires an amount of “letting go” on the part of the organizer, who must recognize that the participants will develop a richer approach and solution to the challenge at hand. At the start of the process, participants sit in a circle, or in concentric circles, to get oriented and start to create their agenda. 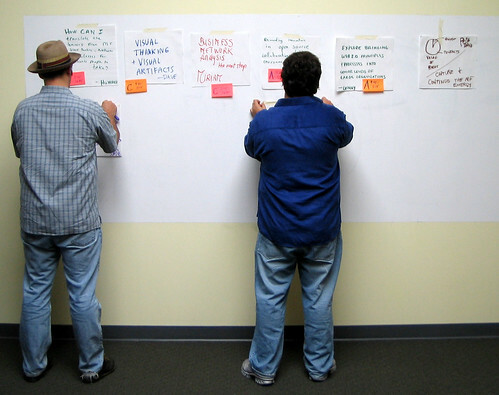 Given the challenge of the meeting, participants are invited to come to the center and write out an issue they’re passionate about, and then post it on a “marketplace” wall with a time and place at which they are willing to host the discussion. All are invited to create an item for the marketplace, but no one is required to. Creating the agenda in this fashion should take between 60 and 90 minutes. The breakouts then begin, typically lasting 90 minutes per session. Participants may organize their breakouts however they see fit; the host records the discussion so that others may join the conversation at any time. Participants are asked to observe the one law of Open Space, the Law of Two Feet, which asks that if you find yourself neither learning nor contributing, use your two feet to go somewhere else. In this sense, participants are given full responsibility over their learning and contributions. Breakouts may last for a day or more, depending on the scope of the event. Closing the event may take many forms, the least desirable of which is a formal report from the groups. Instead, return to the circle arrangement that started the event, and open the space again for participants who want to reflect on what they’ve discovered and their next steps. 1. Whoever comes are the right people. Passion is more important than position on an org chart. 2. Whenever it starts is the right time. Spirit and creativity do not run on the clock. 3. Whatever happens is the only thing that could have. Dwelling or complaining about past events and missed opportunities is a waste of time; move on. 4. When it’s over, it’s over. When a conversation is finished, move on. Do the work, not the time. You can read more about Open Space at openspaceworld.org. 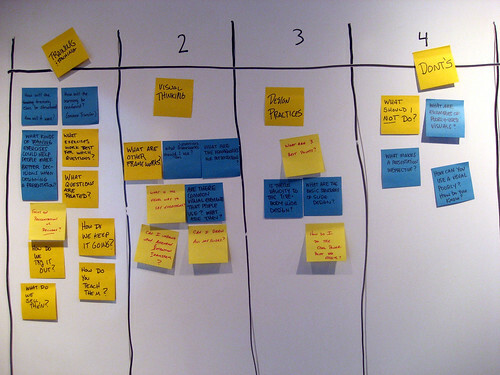 Open Space game rules been popularized and incorporated into many self-organizing events which are known under different names, most prominently BarCamps and Unconferences. The concept of Open Space was put forth in Open Space Technology: A User’s Guide, by Harrison Owen. If a picture is worth a thousand words, what would 50 pictures be worth? What if 50 people could present their most passionate ideas to each other—without any long-winded explanation? A poster session accelerates the presentation format by breaking it down, forcing experts to boil up their ideas and then present back to each other via simple images. To set up, everyone will need ample supplies for creating their poster. Flip charts and markers are sufficient, but consider bringing other school supplies to bear: stickers, magazines for cutting up, and physical objects. 1. It must be self-explanatory. If you gave it to a person without walking her through it, would she understand? Before and After: Describe “why” someone should care in terms of drawing the today and tomorrow of the idea. 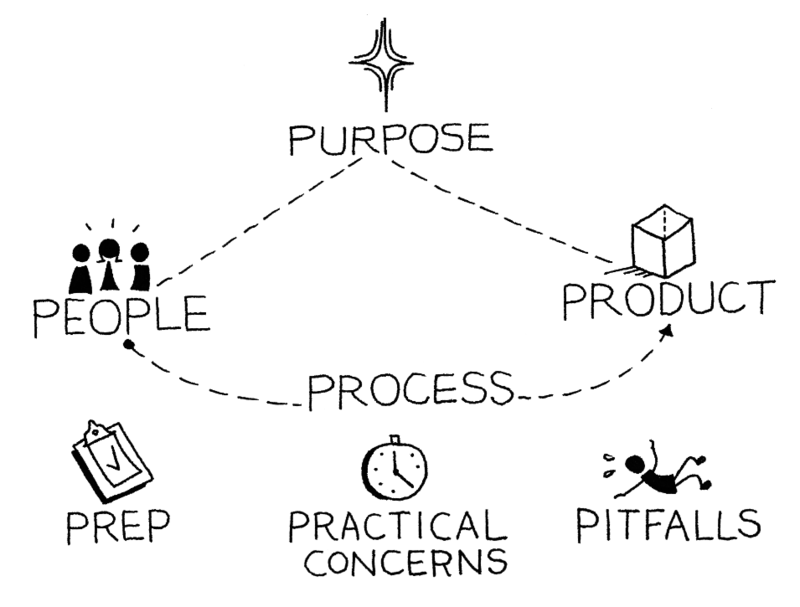 System: Describe the “what” of an idea in terms of its parts and their relationships. 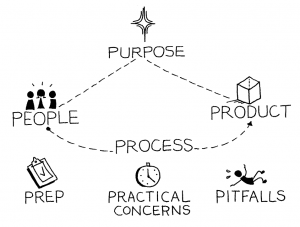 Process: Describe the “how” of an idea in terms of a sequence of events. Give participants 20 minutes to create their posters. When they have finished, create a “gallery” of the images by posting them on the wall. Instead of elaborate presentations, ask the group to circulate and walk the gallery. Some posters will attract and capture more attention than others. From here, it may be worthwhile to have participants dot vote (see Dot Voting) or “vote with their feet” (See Open Space) to decide what ideas to pursue further. As a variation, the posters may be created in small groups. In this case, it’s important for the group to have decided ahead of time what their topic will be, and to give more time to come to a consensus on what they will draw and how they will draw it. On a smaller scale, a group may do this around a conference table. A small group of experts may create posters to explain their different points of view to each other at the start of a meeting, to make their models of the world, their vocabulary, and their interests clear and explicit. Twenty minutes spent in this way may save the group from endless discussion later in their process. 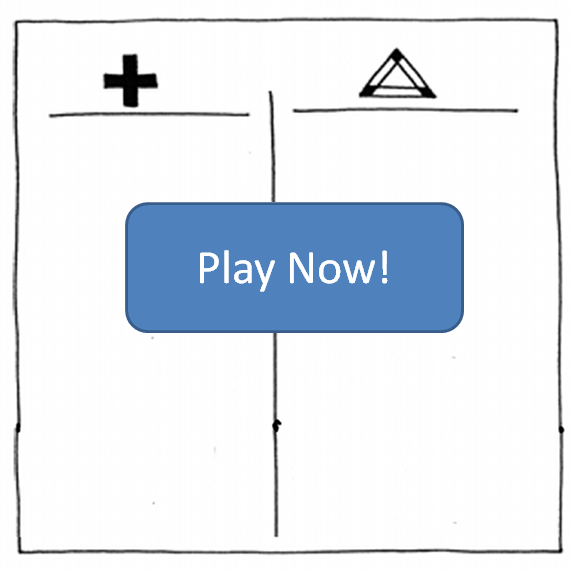 The Poster Session game is based on academic poster sessions, in which authors of papers that are not ready for publication share their ideas in an informal, conversational group. Although not a formal game, unstructured time, whether it’s a walk in the park, an informal lunch, or just a short break, is not only helpful but critical to the creative process. A break allows people time to process new information. It gives teams time to gel as a unit so that all the players can get to know each other. It also gives people a chance to catch up on details of their work or personal lives, which helps reduce the stress in the session. Thomas Edison and Leonardo Da Vinci were both known for taking short naps interspersed with intense working sessions. The break gives ideas a chance to settle and creates opportunities for them to merge and collide with previous knowledge or other people’s ideas. 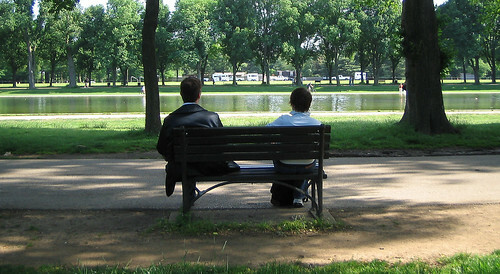 Invites teams to take a walk, take informal time to get to know each other or catch up on outside work. Skipping breaks is a dangerous business. Don’t underestimate the power of a break to renew, refresh and reinvigorate your team. Idea Generation and the Quality of the Best Idea,” researchers found that a hybrid approach that combined group work with individual time for reflection resulted in the most quality ideas.